You probably only have two options for a carport: prefabricated metal carports and built-on additions to the house. A carport works to shield your vehicle from some rain and sun but leaves the majority of the vehicle exposed. Closing in your carport will increase the level of protection from the various elements. Standard carports are simple roofs with support beams. A prefabricated carport encloses the vehicle beneath a metal roof using steel supports. Complete the construction of the carport to make it a full garage if you like. The sides and back of the carport can be enclosed in standard sheet metal, painted to match the roof. 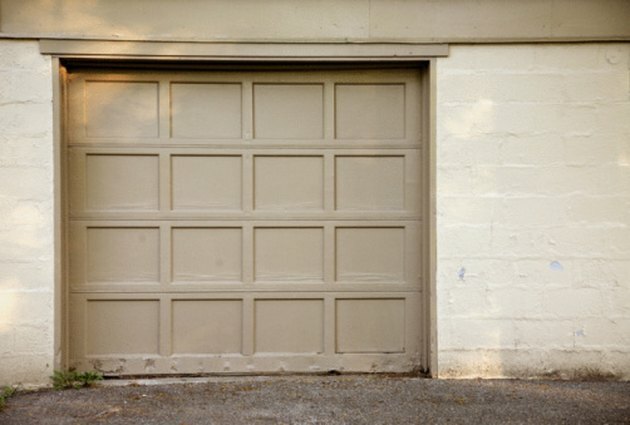 You can even install a garage door with some larger models and can extend the same styles used on the house to an attached carport to complete an attached garage. The downside of converting the carport to a full garage is ventilation. You will need to add roof- or wall-mounted ventilation to avoid excessive heat. Carports are open on four sides. You can partially enclose either a prefabricated or an attached carport without taking away the free movement of air. Attaching the sheet metal to two sides of the standalone carport provides substantially more protection from the elements. Finishing the wall on the outer side of the attached carport accomplishes the same level of protection. You can also install steal or brick support beams on the back entrance to the carport to create a third wall without restricting airflow or foot traffic. Latticework is wood or metal structures laced together to provide a moderate barrier without severely restricting airflow or visibility. Adding latticework to two or three walls of a carport allows the unit to maintain aesthetically pleasing appearances while limiting the exposure to the elements. You can also attach plastic linings to the inside of the latticework during winter to produce a barrier to the cold. Removing them for summer allows for protection from the rain and elements while not causing the area to become overly hot.